Posted by Teresa Mihelic HelpDesk on Tuesday, August 14th, 2012 at 10:41am. This is a great and very unique event returning to Doheny State Beach in Dana Point. The Rainbow Sandals Gerry Lopez Battle of the Paddle is a California classic event, where the main focus is the stand-up paddle (SUP), with races and demonstrations of the sport, for all ages and skill levels. From begginners of all ages, family rela ys or group relays, and elite competitions, the event sure will have something for everyone! SUP is the fastest growing water sport in the world! Expecting over 1,000 entries coming from around the globe for this year’s battle. They will be fighting for over $25,000 in cash & prizes – the largest on offer in the sport of SUP. Fortunately, Doheny State Beach, as part of the California State Park System, offers the ideal venue to accommodate huge numbers of athletes and spectators. 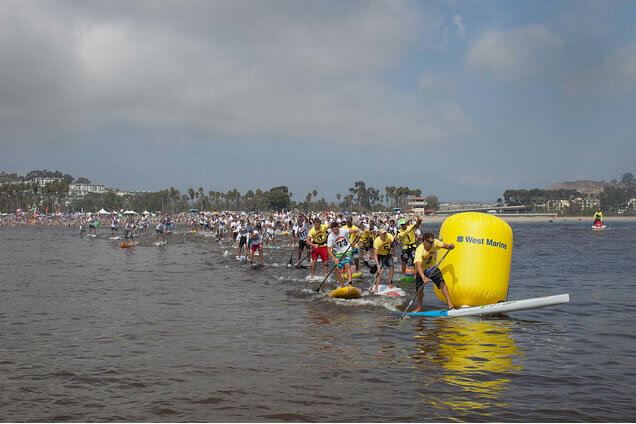 For kids, there's SUP kid races, and the event will also have expositions and kid friendly activities organized by the Doheny State Beach Interpretive Association. For more information on how to sign up for the races, visit http://www.battleofthepaddle.com - everyone who enters gets a pair of Rainbow Sandals, an event t-shirt and lunch. Keep in mind all proceeds benefit the Doheny State Beach Interpretive Association.